With his Oscar-winning directorial debut Get Out, Jordan Peele gave the world a powerful metaphor for everyday, engrained oppression. In the sunken place, the film's black characters are sent falling down an endless rabbit hole while their lives are controlled by wealthy white folks. African Americans are forced to watch from a cavernous expanse of darkness, all as someone else pulls their strings. Robbed of agency, they become passengers in their own journey, rather than drivers of their fate. 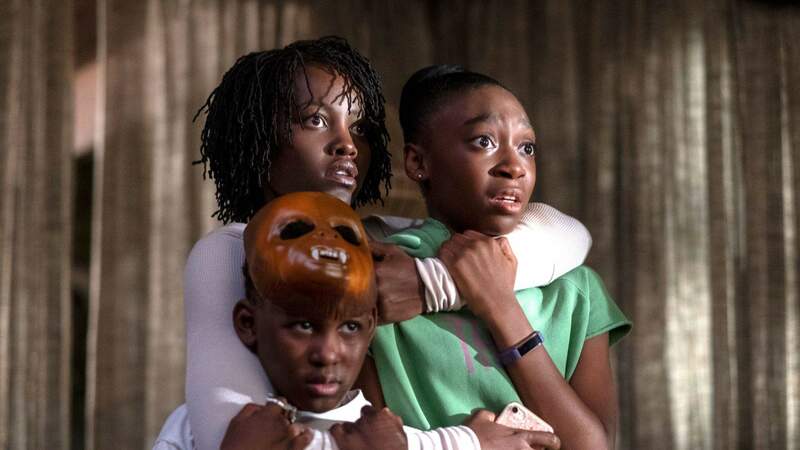 The movie's brilliant blend of scares and social satire gives more flesh to the scenario, but the mechanics are straightforward: one race is sent plummeting; the other climbs higher through their subjugation. Peele's concept isn't a one-time idea, as his sophomore film shows. Us doesn't feel like Get Out redux for even a split second, but it does give another clever and chilling dimension to the notion of flailing versus prospering — and another example of who's doing both. This time, the writer-director puts class under his magnifying glass, while still training his gaze firmly at his country. It's not by accident that the movie's title can be read as U.S., aka the United States. That's not supposed to escape anyone's attention. Perhaps the greatest trick that Peele pulls, however, is slicing into the horror of just peering in the mirror and thoroughly detesting what's looking back. After a quick glimpse at an ad for 80s charity campaign Hands Across America, Us' 1986-set prologue sends a young girl (Madison Curry) into an actual house of mirrors. "Find yourself" the funhouse at the Santa Cruz beachside amusement park promises. She does, although not in the usual way — and as flashbacks remembered by the adult Adelaide Wilson (Lupita Nyong'o) reveal, she's left forever shaken by the process. In the present day, Adelaide returns to the Californian spot with her husband Gabe (Winston Duke) and children Zora (Shahadi Wright Joseph) and Jason (Evan Alex). She's wary and worried as her family pals around on the beach with their better-off friends, the Tylers (Elisabeth Moss, Tim Heidecker, Cali Sheldon and Noelle Sheldon). Later, Adelaide tries to explain her visible unease to Gabe, confessing that she has always felt as if her other self was coming for her. With the arrival of the Wilsons' doppelgängers on their driveway that night, her words are proven accurate. Decked out in matching red jumpsuits, wearing lone tan gloves and clutching golden scissors, the sinister doubles call themselves 'the tethered' — and they're here to cut that name to ribbons. What begins as a tense, terrifically staged home invasion soon becomes much more, as Adelaide and her loved ones face off against their murderous counterparts. The terror that follows boasts more angles than the reflective maze that starts this unnerving story. It also contains more twists and turns than the abandoned and unused tunnels buried beneath the U.S., as pointedly referenced in the film's opening title card. Finally, it features more meticulously deployed pop culture references and nods than might be expected in a movie that remains so thoughtfully distinctive. Us is a creeper in multiple senses of the word. It's disquieting from the outset (even more so when it spends its opening credits staring at caged rabbits), but Peele knows how to let that unease fester and grow. While the 'master of suspense' label was bestowed decades ago, the comedian-turned-filmmaker is just as devastating at cultivating distress as Hitchcock or any other iconic horror or thriller director. He's similarly adept at using every tool in his arsenal. After giving It Follows such a disconcerting look, cinematographer Mike Gioulakis does so again here, especially while shooting in domestic spaces. Aided by a few choice song selections that range from NWA to the Beach Boys, Get Out composer Michael Abels conjures up another needling score designed to set viewers on edge. But it's the way that Us' agitated, anxious mood refuses to dissipate that marks the movie as something special. The narrative and its ideas are undeniably creepy and, even when some aspects initially seem a tad too obvious, the film resonates long after viewing. Us' tone, images and sounds reach further, however, truly and deeply creeping under the audience's skin. The simple sight of four shadowy figures looming over a house in the dark of night instantly demonstrates how effective Us is in a visual sense. Choreographed movements of the balletic, stilted and frantic kind do as well. They also highlight Us' other key element, because central to the malaise is Peele's cast. Their characters might battle themselves, but the actors never do the same, always making their dual roles feel like individual creations. If Daniel Kaluuya can earn an Academy Award nomination for Get Out, there's no reason that Nyong'o can't achieve the feat for her twin parts as both a fraught, complex victim and a calm, unrelenting aggressor. Her performance as Red, Adelaide's mirror image, is as delightfully disconcerting and affecting as the doppelgänger's gravelly, haunted voice. From Duke's transformation from goofy dad to non-verbal brute, to Joseph's expressiveness as both a too-cool teen and a psychopathic killer, to a particularly flighty then unhinged turn from Moss, Nyong'o is also in great company. Of course, that's one of the movie's mischievous tricks: as it delves into the divide between 'us' and 'them', it puts everyone in the same unsettling situation.